With a ceremonial good luck champagne bottle shattered against the freshly-painted Seven Seas Splendor hull, the new Regent Seven Seas' ship celebrated a construction milestone on Feb. 9 as she floated from the building dry dock to touch the sea for the first time. The post Regent Seven Seas Splendor Completes Dry Dock appeared first on Avid Cruiser. Regent Seven Seas' new Oct. 22 – Nov. 1, 2019 Cuban Exploration sailing aboard Seven Seas Mariner includes a full day and evening in Havana. The post Regent Seven Seas Announces 2019 Cuba Itinerary appeared first on Avid Cruiser. My aspirational cruises or 2019 include five unique itineraries offered by Windstar, Scenic, Seabourn, Regent, and Silversea. The post My Top 5 Aspirational Voyages For 2019 appeared first on Avid Cruiser. Regent Seven Seas Cruises revealed its 2020-2021 itineraries, which showcase 167 sailings including maiden calls to 11 new ports. The post Regent Seven Seas Highlights 2020-21 Itineraries appeared first on Avid Cruiser. Regent Seven Seas Cruises announced its 2021 World Cruise that will provide guests with access to 56 UNESCO world heritage sites across the globe. The post Regent Seven Seas’ Details for 2021 World Cruise appeared first on Avid Cruiser. 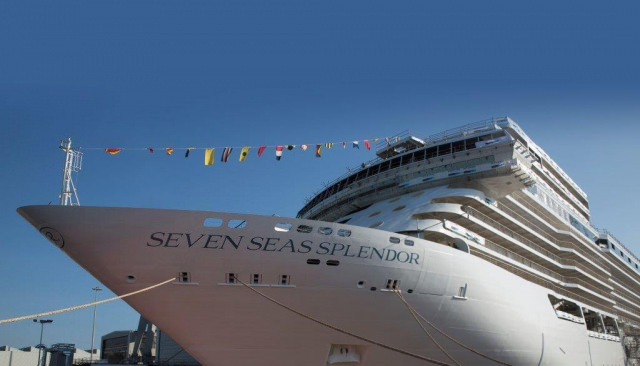 Seven Seas Splendor will voyage across Europe during her inaugural 15 summer sailings after joining Regent's fleet in February 2020. The post Booking Begins for Seven Seas Splendor appeared first on Avid Cruiser. Reservations open for Seven Seas Splendor's 2020 inaugural European summer itineraries on July 12, 2018. The post Seven Seas Splendor Keel Laying Ceremony Takes Place appeared first on Avid Cruiser. They are two of the world’s most popular luxury lines: Crystal Cruises and Regent Seven Seas Cruises. Sailing worldwide itineraries, both of these all-inclusive lines are distinguished by their high caliber of service, their exceptional cuisine, and sumptuous onboard appointments. Both Crystal and Regent have recently put their ships through multi-million-dollar makeovers intended to spruce... [Read More] The post Crystal Cruises vs. Regent Seven Seas Cruises: Key Differences (Updated 2018) appeared first on Avid Cruiser. As the only North American luxury cruise line to be granted permission to offer voyages to Cuba, Regent Seven Seas Cruises is adding more visits to the Caribbean island on two itineraries in 2019 and 2020. Seven Seas Mariner will offer the line’s first immersive Cuba itinerary on her October 15, 2019 voyage, calling on... [Read More] The post Regent Seven Seas Will Offer Luxury in Cuba appeared first on Avid Cruiser. Regent Seven Seas Cruises confirmed details for the upcoming bow-to-stern refurbishment of Seven Seas Mariner, the world’s first all-suite, all-balcony cruise ship. After a 20-day drydock in April 2018 at Chantier Naval de Marseille, Seven Seas Mariner will re-emerge with new culinary experiences, new suite designs, and renewed guest spaces. After her drydock refurbishment, Seven... [Read More] The post Regent Seven Seas $125 Million Fleetwide Refurbishment Program appeared first on Avid Cruiser. Regent Seven Seas Cruises unveiled its new 2019-20 voyages season, comprising 118 new sailings, departing from March 2019 through June 2020 aboard four of the world’s most luxurious cruise ships, Seven Seas Explorer, Seven Seas Mariner, Seven Seas Voyager, and Seven Seas Navigator. Travelers can choose among new itineraries that range from seven to 131 nights in the... [Read More] The post Regent Seven Seas Announces 2019-2020 Itineraries appeared first on Avid Cruiser. Ultra-luxury line Regent Seven Seas Cruises made waves a few years back when it introduced free, unlimited shore excursions on its worldwide voyages. It bumped the line up to a new level of inclusiveness that even luxury travelers were unaccustomed to, and became the benchmark by which many other luxury cruise lines are measured. All... [Read More] The post The All-Inclusiveness of Regent Seven Seas appeared first on Avid Cruiser. Spanning approximately 33,870 nautical miles across 11 seas in three oceans, Regent Seven Seas Cruises’ new 2020 world cruise will deliver opportunities for travelers seeking to experience the world for the first time – or again. The all-suite, all-balcony Seven Seas Mariner will host Regent’s new 2020 Navigate the World cruise, a captivating 131-night itinerary, departing January... [Read More] The post Regent Seven Seas Announces Seven Seas Mariner as Host Ship for 2020 World Cruise appeared first on Avid Cruiser. Mark Conroy, president of Regent Seven Seas Cruises, discusses why it's better to use a travel agent than to book directly with cruise lines like his. Mark Conroy, president of Regent Seven Seas Cruises, comments on Signature Travel Network.